Zài jiàn, everyone! It was wonderful to meet you and to learn together. Thanks so much for your good cheer, enthusiasm and insightful questions. I hope we will meet again some day. 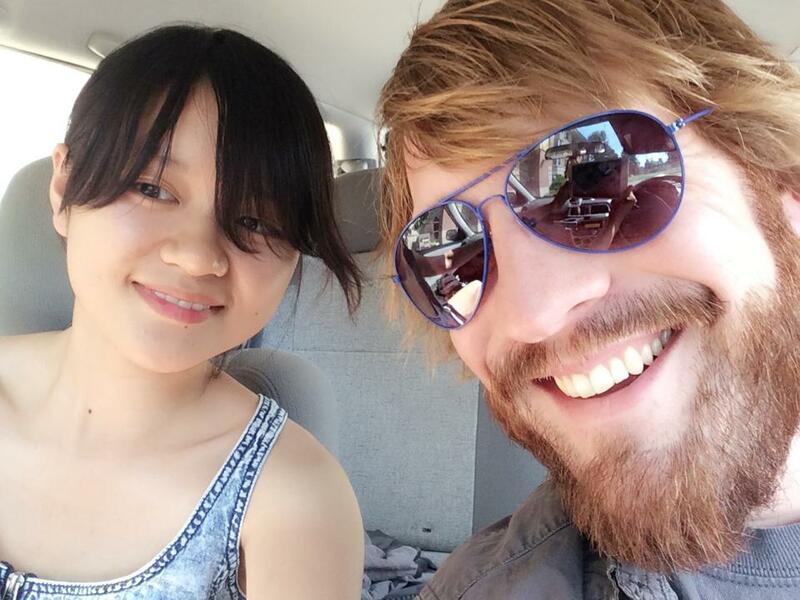 Lin Li and Missoula Independent reporter Alex Sakariassen on their way to an interview. I was a little bit nervous when I sat in the Missoula Independent’s newsroom for meeting about news topics for the next issue. The editor was critical and picky and asked for unique angles or local perspectives all the time. But what really surprised me is that reporters are given so much time and space to dig for news stories and that have a say in deciding what kind stories to follow. Instead of being assigned certain topics, reporters have greater say in their news reporting. Before this experience I thought reporters spent most their working time writing. However, I saw them making phone calls to reach their news sources all day. Alex Sakariassen, the reporter I followed for the job shadowing, made scores of phones each day. He told me he would call people he wanted to talk to several times a day if he received no replies. When asked for his secret to the creativity of his news writing, he told me that all ideas come from his daily conversations with different people. It surprised me because I usually put the writer’s skills or profession knowledge at the top of the agenda. In my observations of two days’ job shadowing, I found that nothing is more important than a good personality and good communicative skills. These qualities are what I really need to try hard to acquire as a journalist. The job shadowing was such a wonderful experience because it gave me a chance to see how the newsroom works up close and how reporters reach their sources. I really appreciate that. I went to the Missoula Independent, a free weekly alternative newspaper in Missoula. My assignment was to follow veteran reporter Jessica Mayrer, who often tackled complicated and controversial stories. In the most recent Missoula Independent newspaper, she wrote an environmental story about legal struggles over water resources in Montana’s Flathead Valley. For next week’s issue, she is gathering materials about the courts and the legal problems divorced couples have over such controversial problems as parenting, money and property. I followed her to interview an attorney for West Montana Bar Association, who knows about such things. After that I attended the newspaper’s weekly planning session, which is supervised by editor Skylar Browning. Reporters and editors shared their thoughts about the stories they were following and hoping to finish for the next issue. On the second day Jessica and I went to court and attended a hearing on some of the family problems she is interested in learning about. Unfortunately, the couple involved didn’t show up, so we interviewed the judge instead about problems with the family law. It was a great experience. I went to the campus radio station, KUFM, which is an affiliate of NPR. My hosts were Corwin Carney and Conrad Schied. I didn’t go anywhere these two days, but I saw and learned a lot. Corwin Carney and Conrad Schied are still students, but they’ve been hired as trainees to do the afternoon regional news for Western Montana. They rewrite the wire and work with audio stories submitted by MTPR reporters in Helena and Kalispell. Other at the station call them the “news boys.” After rewriting the stories, they calculate the exact time required for each story by reading them several times. They make the program schedule, according to the forecast time. What’s also interesting is that they have a scanner that monitors police and emergency radio channels. If anything newsworthy happens, they can rush out to do an interview. I also met Amy Martin. She in charge of the control room while the news boys read their stories. She introduced me to the control room, and I watched the whole live broadcast. After that, I recorded a station identification track with Amy’s help. She said they would broadcast my voice for many years. The next day I met Beth Anne Austein. She was recording a program called “The Food Guys,” featuring hosts Jon Jackson and Greg Patent. Patent was born in Shanghai during World War II, and his son, who speaks very good Mandarin Chinese, has lived in China for many years. One of the Food Guys’ recent topics was Chinese rice wine, which my grandma has made millions of times. I also went into the studio to see the program called “Jazz Sessions,” whose hosts were Greg Patent and Terry Conrad. I did my job shadowing at KPAX-TV, which is Missoula’s CBS affiliate. I observed the production of two shows: KAJ news at 5:30pm and KPAX news at 5:30pm. The former usually is taped at 4 p.m. and the latter is a live news show at 5:30pm. Both of them have the live sports news. My host reporter, University of Montana graduate Brin Merkley, covers the crime beat, among other things. She goes regularly to the police station and the court to learn about the cases that interest her. She studies online records for stories about felonies, which are the most serious crimes. She told me that you don’t need to care about lesser crimes called misdemeanors unless they are “super unusual.” She said she watches for stories about drugs, especially if they are related to methamphetamine, which is a very dangerous and addictive substance. She and I went to the police station and met Sgt. Travis Welsh, the public information officer. She asked for details about a about stolen vehicle, a burglary, a theft and other cases that interested her. Most of them were not very newsworthy. Then we visited the sheriff’s office in the court house to look at public records about two cases. One was about a German exchange student who was shot and killed this spring as he trespassed on private property. The other was about a former University of Montana basketball player who has been accused of illegally selling more than 1,000 pills of Adderall, a prescription drug. What impressed me most were the efforts Brin made to build good relationships with the law enforcement agencies. “I have to meet them every day, and I treat them as my old friends, not only for the information but also for their kindness to me,” she said. We went back to the TV station and she reported her findings to executive producer Melissa Rafferty, who is in charge of deciding which stories to run and editing the reporters’ work. Melissa told Brin to write the story about the basketball player, and I helped her to find some video clips of him from the KPAX video database. I was surprised to learn that all of the station’s videos are kept forever on different hard drives. I also stayed in the studio to watch Brin broadcast the KAJ news. It was her first practice to be an anchor on KPAX, and she really did a good job! After the show, she was so diligent and replayed the tape to correct her tone and pronunciation. She told me that she was so excited because she is getting closer to her dream.